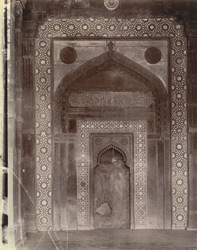 Photograph of the central mihrab in the Jami Masjid, Fatehpur Sikri, from the Archaeological Survey of India Collections, taken by Edmund William Smith in 1893. The palace-city complex at Fatehpur Sikri was built by the Mughal Emperor Akbar (r.1556-1605); the Jami Masjid was completed in 1572. The mosque was dedicated to Shaikh Salim Chisti, whose khanqah was nearby. There are three mihrabs in each of the seven bays of the mosque. This is a view of the large central mihrab which is covered by a dome. This mihrab is decorated with white marble inlaid into the red stone, arranged in geometric patterns. All the buildings in at Fatehpur Sikri are built of locally quarried red sandstone, known as Sikri sandstone.